Here is a unique opportunity for any 10-speed or unicycle fan. I like it, but where are the reflectors for safety? 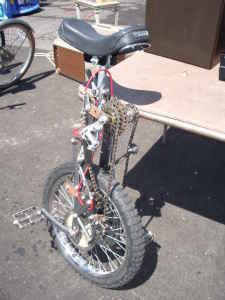 Pictured below is a homemade unicycle fitted with sprockets, chains, and an ingenious derailer system. Designed to outmatch the wildest circus stunt performer, -an engineering marvel in my opinion. As a boy I rode unicycles and performed stunts in front of large crowds. Even today, 40 years later I still own my 24″ Schwinn AND my 6+ ft tall giraffe unicycle built by the late Bernard Crandall, whose unicyclist son Floyd gained nationwide fame. But never before have I seen a contraption such as this! Any rising young stars out there? Located south of Sashabaw & Maybee Rds. Hi, my name is Etienne, I enjoy do unicycle in street and forest. I m really interresting by your unicycle with 10 speed. Can you spend it in France? Can you take me more picture on my mail? For How speed can you go with this unicycle? 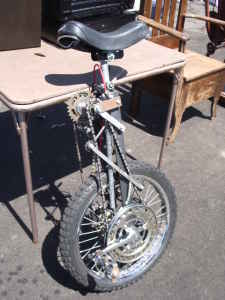 I just found an ad for this unicycle on craiglist.org. I’m not actually in possession of it. Good Luck. I own four unicycles; (2) 24″, (1) 20″ and (1) five-footer. This is the first ten-speed that i’ve seen. Interesting. Impossible ! how can you stay up with a freewheel. Fixie is only way it seems to me unless this rider actually goes straight ahead only. Is there a brake? I have never seen a unicycle like this and I build unicycles. Bernard Crandall was my Great uncle, my family has been building unicycles for 4 generations. Rex Crandall, Bernard’s brother was my grandfather. He was highly involved too.